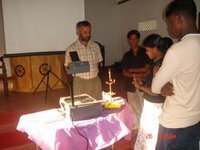 This leadership training programme was in Kaluthara District. It was held in kaluthara Gangarama temple in the north. Our objective was to develop their leadership capacity as well as to develop the skills of them. This programme had been organized by the Kaluthra district Fisheries Solidarity with help of the Youth and environmental affairs coordinator Mr. Luksiri Fernando, specially the convener of NAFSO Mr. Herman Kumara also participated for that as a facilitator and the observer. More than 40 youths with girls were trained by this programme. We are already in the field to biuld up a Sustainable environment and a Youth movement.